Col de la Pierre Saint-Martin (el. 1760 m.) is a mountain pass on the France-Spain border in the western Pyrenees in the department of Pyrénées-Atlantiques (France) and Navarra (Spain). The climb from the Spanish side was used in the 2007 Tour de France. Close to the summit of the pass, there is the ski station of Arette-Pierre-Saint-Martin. The southern side of the climb, starting from Isaba (Navarra, Spain) is 27 km long at an average of 3.6% (height gain - 966 m). The final stages of the climb start at Larra Belagua (1026m.) with 14 km at 5.2%, with a maximum of 7.4% The pass is situated south east of Oloron-Sainte-Marie. Starting from Arette (north east), the climb is 25.8 km long gaining 1466 m. (an average of 5.7%). En route, the climb passes over the Col de Labays (1351m. ), the Pas de Guilhers (1436 m.) and the Col du Soudet (1540 m.). Here's the our members favorite photos of "Mountain Passes near Pyrenees". 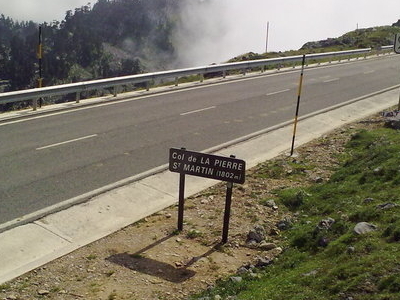 Upload your photo of Col de la Pierre St Martin!